USB Stewie Griffin | OhGizmo! I give up trying to make this article funny. Writer’s block, etc. 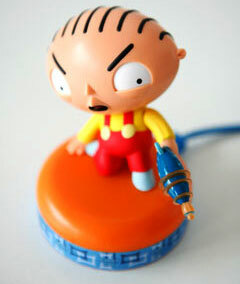 Just know that there is a Stewie Griffin USB gadget. It plugs into your PC, and after installing the software, will spew any one of a number of Stewie Griffin catchphrases, such as “Silence!” “Stop mocking me!” and (hopefully) “Your anguish sustains me…” upon pressing certain key combinations on your keyboard. It’s $28, from Urban Outfitters. That seems great. Anything with sound and movement rocks!